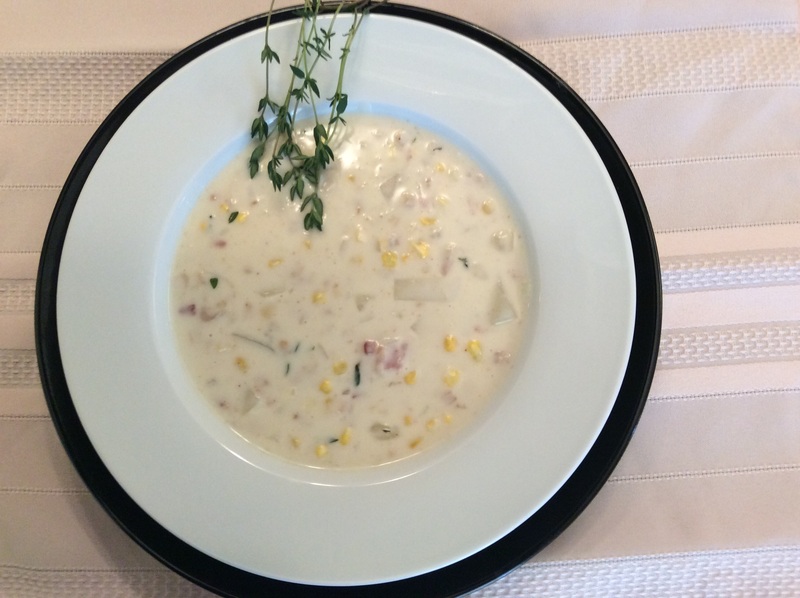 New England Clam Chowder (sorta) | Let's Eat! I give my friend Chris Brennan and his son Keegan a hard time about their favorite teams, but it’s mostly because their teams are so good and give my teams the best competition they see in both football and hockey. This posting is throwing out props and well wishes for the patriots for their Superbowl appearance. Whether you like them or not, you have to respect Tom Brady for his record-setting 6 appearances and likely 4th win matching Terry Bradshaw. I love clam chowder and it really is easy to make, but I think my optional ingredients kick this up a notch! Try it and let me know how you like my variation! This recipe can be done by preparing your own steamed clams, but I recommend the jar or canned variety. They are so much more predictable and I guarantee that noone will notice the difference. 1 teaspoon chopped fresh Thyme or 1/2 teaspoon dried Thyme. Heat a large soup pot and add the bacon and cook until crispy. Add the diced onion, a bay leaf, thyme, white pepper, and butter. After the butter melts, sprinkle the flour over the other ingredients, and stir to blend in the flour. Cook for about 5 minutes and add the clam liquid from the can or jar. Then add the diced potatoes, and milk. Bring to a boil, stir frequently and then reduce the heat. Simmer until the potatoes are tender – 10 minutes. Stir periodically. Add the clams and the heavy cream and cook for a few minutes more. Here’s the kicker! Add corn right at the end and after serving in a bowl add about a tsp of Sriracha to the bowl! Amazing! This entry was posted in Recipes and tagged Clam Chowder, Corn clam chowder, New England clam chowder, Scriracha clam Chowder. Bookmark the permalink.